We are Dalmi and Emma, two Hungarian girls and we are currently traveling in Asia after having finished our university studies. We will be spending three weeks at Leo Guesthouse as volunteers and we are looking forward to explore Seoul and make new friends here! 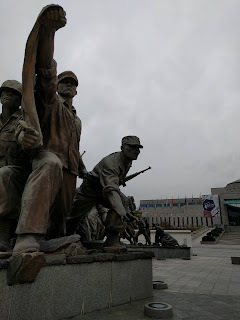 So far we didn't have too much time to visit many places in Seoul but yesterday we had the chance to see The War Memorial of Korea. The memorial made a great impact on us as we are really interested in Korean history and have read various books on the topic. We spent more than two hours inside and we still want to go back to explore the rest of it! Tomorrow we have a free day to explore more of Seoul and it's wonderful culture and people. We can't wait!